83 ⅞ x 69 ½ in. 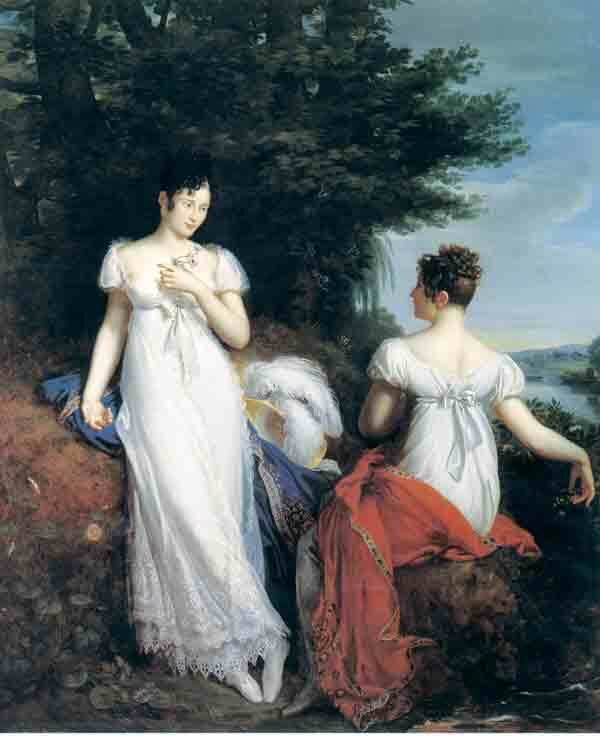 Princess Pauline Borghèse and her friend, the Baroness de Mathisse, model the latest fashions in René–Théodore Berthon’s large painting. The youngest sister of Napoleon Bonaparte, Pauline was recognized as a fashion trendsetter and legendary beauty, while also gaining a reputation as one of Europe’s most scandalous women. Here, she and her friend pose with their shawls, the true markers of high end fashion. Shawls and other mid- and near-East woven goods were brought to France by Napoleon’s officers, and they quickly became fashionably exotic accessories. Their bright colors and decorative patterning brought lightness and visual interest to the subdued styling of Empire gowns.